After a promising rookie season with the 1909 Brooklyn Superbas, the baseball career of left-handed pitcher-outfielder George Hunter abruptly nosedived. For reasons uncertain but most likely involving arm trouble, Hunter abandoned pitching after his freshman campaign, spending the remainder of his playing days in the outfield. The position shift was not a success, for the switch-hitting Hunter was a capable batsman – for a pitcher. As an everyday player, however, his stick-work fell short of major-league standards. His defensive work in the pasture was also suspect. Released by Brooklyn early in the 1910 season, Hunter finished his career in the minors, mostly with clubs in the Class B New York State League. George (5-feet-8, 165 pounds) was slightly larger than Bill (5’7½”, 155 pounds). He was also a more versatile player. As a consequence, his baseball career took off more quickly. In March 1907, Sporting Life mentioned the Hunter brothers as returnees for the Pullman club,6 but only Bill would remain in Buffalo. George was moving on. That spring he entered the professional ranks, signing with the Wilkes-Barre (Pennsylvania) Coal Barons of the Class B New York State League.7 Here, he joined fellow left-handers Jack Graney and Jim Swift to form what the Wilkes-Barre Times soon deemed “the best pitching staff in the league.”8 Unlike the other two, Hunter was not a hard thrower. Instead, he relied on breaking stuff that featured “an incurve that cuts the inside corner of the plate,” a pitch that few NYS League batters could handle.9 George quickly became a local favorite, the “silent southpaw” whose outings the Wilkes-Barre Times frequently extolled with descriptives such as “effective,” “excellent,” and “masterly.”10 But while his hometown press notices were good, Hunter’s pitching luck often was not. Pitching for a fourth-place (69-66) team, Hunter was regularly on the short end of low-scoring decisions. Baseball-Reference provides no pitching stats for the 1907 Wilkes-Barre Coal Barons, but perusal of Wilkes-Barre Times reportage puts Hunter’s record in the neighborhood of 12-15 in 31 games pitched.11 He also made a handful of appearances in the outfield, bolstering the Barons’ underwhelming offense with a .301 (28-for-93) batting average. Hunter showed well in 1909 spring camp and made Brooklyn’s Opening Day roster. On May 4, 1909, he made his major-league debut, taking the mound for the first game of a home doubleheader against the Boston Doves (Braves). In the early going he was superb, holding the Braves scoreless while protecting a 3-0 Brooklyn lead. But the top of the fourth frame ended on an unfortunate note, with Hunter injuring his shoulder in a pop-fly collision with catcher Bill Bergen. He was unable to come out for the fifth, giving way to Nap Rucker, who was promptly tattooed for the four runs that paved the way to an eventual 7-6 Brooklyn loss. Hunter soon recovered and won his next start, a complete-game 4-1 triumph at Boston. In addition to his first major-league victory, George registered his first big-league hit, as well – an RBI double off Braves’ left-hander Tom Tuckey. Thereafter, George settled into the role of spot starter, most often used in doubleheaders. He continued to pitch well, but suffered the customary fate of those pitching for a bad (55-98, .357) team. Despite an excellent 2.46 ERA in 113⅓ innings pitched, Hunter’s record stood at a dreary 4-10 by season’s end. He had also made 23 appearances in the Superbas outfield. His defensive work (.871 fielding average) was substandard, but Hunter’s .228 batting average (28-for-123) was on par with the team norm (.229). A modest beginning, to be sure. But given George’s youth (22) and lack of previous big-league experience, many observers predicted a bright future for him. 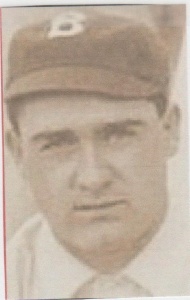 As the 1909 season wound down, syndicated Midwest sportswriter Tommy Clark declared that Brooklyn “seems to have another find in George Hunter, a rattling good left-handed pitcher, a good hitter, a fast baserunner, and a clever fielder – a good all-around youngster.”19 During the postseason, Hunter briefly returned to Wilkes-Barre for a hospital benefit game, taking the hill as Brooklyn’s starting hurler at local insistence.20 Thereafter in December, he joined (as an outfielder) an all-star team headlined by future Hall of Famers Three Finger Brown and Addie Joss for a 12-game exhibition tour of Cuba.21 As 1909 drew to a close, therefore, Hunter had every reason to hope for a lengthy and successful major-league career. Hunter failed to impress new Brooklyn manager Bill Dahlen and he saw little exhibition-game action. Although he was a member of Brooklyn’s Opening Day squad, Hunter remained fastened to the bench in the early going. His only game appearance came in Pittsburgh on May 9, 1910, when he was sent to the outfield in the 10th inning after center fielder Al Burch was ejected. Hunter’s tour of duty lasted a single inning, during which nothing was hit his way. Unbeknownst to Hunter at the time, his major-league career was now completed. Accepting assurances that his ankle was fully healed, Wilkes-Barre paid up, and thereafter re-signed Hunter for the 1913 campaign. But that spring he was painfully tentative in the outfield, often avoiding fielding chances that might stress his ankle. Unimpressed by Hunter’s performance, newly installed Wilkes-Barre field boss Joe McCarthy (the future Hall of Fame manager) released him early in the season. Before long, however, Hunter found a berth with a New York State League rival, the Elmira Colonels.29 George rewarded his new club’s confidence by batting .308 and playing more than adequate outfield defense. He remained an Elmira outfield regular through the 1917 season, posting batting averages that ranged from .253 to .305. At the close of the 1917 season and with the United States now an active participant in World War I, George Hunter hung up the glove. He was only 30 years old. George had married Anna Alexander in October 1908, a union that would last almost 60 years. But the Hunters had no children, making George a potential conscription target. Ultimately, he was not called to arms, and by 1920 he was employed as a traveling salesman for a Harrisburg company. In time, he joined the Harrisburg Post Office, where he worked until retirement in 1956. As he grew into old age, George developed heart disease. Admitted to Dauphin County Hospital in Harrisburg, George Henry Hunter died from pneumonia and other complications of his heart condition on January 11, 1968.30 He was 80. After funeral services, his remains were interred at Rolling Green Memorial Park in nearby Camp Hill, Pennsylvania. He was survived by his wife, Anna, but predeceased by his five siblings, including twin brother Bill, who had passed away in 1934. Sources for the biographical detail presented herein include the George Hunter and Bill Hunter player files with questionnaires maintained at the Giamatti Research Center, the National Baseball Hall of Fame and Museum, Cooperstown, New York; US and state census reports; World War I and World War II draft registration form data; Hunter family info posted on Ancestry.com; and certain of the newspaper articles cited below. Unless otherwise noted, stats have been taken from Baseball-Reference and Retrosheet. 1 The Hunter twins never appeared in a major-league game together. That feat was first achieved by identical twins Joe and Red (Maurice) Shannon of the Boston Braves. On October 7, 1915, the Shannons played the infield for the Braves in the season-ender against the New York Giants. 2 The other Hunter children were Jennie (born 1880), Ella (1884), Walter (1889), and Florence (1891). 3 As per the 1905 New York State Census. 4 According to the Buffalo Evening News, April 13, 1934. 5 See Sporting Life, March 7, 1907, and the Buffalo Evening News, April 13, 1934. George may also have pitched on occasion for a club in Conneaut, Ohio. See Sporting Life, August 17, 1912. 6 See Sporting Life, March 7, 1907. 7 See Sporting Life, March 30, 1907. 8 Wilkes-Barre (Pennsylvania) Times, June 11, 1907. 9 As per the Wilkes-Barre Times, July 17, 1907. 10 See, e.g., the Wilkes-Barre Times, June 24 and August 3, 26, and 31, 1907. 11 The 12-15 record is the writer’s estimate based on review of published Wilkes-Barre Barons box scores. 12 As reported by the Wilkes-Barre Times, September 10, 1907, and Sporting Life, October 19, 1907. 13 As reported in Sporting Life, November 30 and December 14, 1907. 14 Wilkes-Barre Times, December 23, 1907. 15 According to Sporting Life, March 28, 1908, and the Wilkes-Barre Times, April 18, 1908. 16 As per the Wilkes-Barre Times, March 26, 1908, and Washington Evening Star, April 18, 1908. 17 As reported in the Wilkes-Barre Times, August 27, 1908, and Sporting Life and the Jersey (Jersey City) Journal, November 28, 1908. 18 As per the Wilkes-Barre Times, September 25, 1908. 19 As published in the Canton (Ohio) Repository, September 12, 1909, Daily (Springfield) Illinois State Register, September 22, 1909, and elsewhere. 20 See the Wilkes-Barre Times, September 25, 1909. 21 As reported in the Daily Illinois State Register, December 3, 1909, Grand Forks (North Dakota) Daily Herald, December 4, 1909, Denver Post, December 6, 1909, and elsewhere. 22 See, e.g., the Baltimore Sun, December 25, 1909. 23 As reported in the Boston Herald, Boston Journal, and Richmond Times-Dispatch, May 28, 1910. 24 Jersey Journal, June 16, 1910. 25 As reported in the Wilkes-Barre Times, August 9, 1910, and Trenton Times, August 14, 1910. Wilkes-Barre manager Bill Clymer subsequently sought redress, claiming that minor-league czar John H. Farrell had misapplied precedent in recognizing Dorner’s free-agent claim, but Farrell’s ruling was ultimately sustained by the National Board of Arbitration. See Sporting Life, April 22, 1911. 26 As reported in Sporting Life, September 16 and 23, 1911. 27 As per Sporting Life, October 14 and December 23, 1911, and January 13, 1912. 28 As reported in the Wilkes-Barre Times, March 2 and 3, 1913, and Sporting Life, May 31, 1913. 29 As reported by the Wilkes-Barre Times, May 21, 1913. 30 As reflected in the death certificate contained in the George Hunter file at the Giamatti Research Center.